We are pleased to have you join us for a journey back though time to 1864. We strive to make this event both reenactor and spectator friendly. Our deepest appreciation goes to our sponsors and supporters whose generosity makes these events possible. We also appreciate the sincere dedication of the reenactors and a small army of local volunteers in preserving and sharing our history. Our event offers many opportunities to participate with something to please everyone. 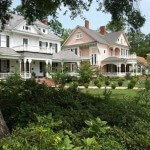 The unique art collection at the Brown House is an excellent way to learn more of the personal and community histories of the Civil War in Washington County. The narrated Bus Tour allows one to actually stand on the ground of important historical sites. The Blue-Gray Masquerade Ball is open to the public, which is a rare occurrence for most reenactments. The Christian Worship Service provides all with the opportunity to share a church service with others from near and far. While you are here, take time to explore some of the local attractions and shopping opportunities. 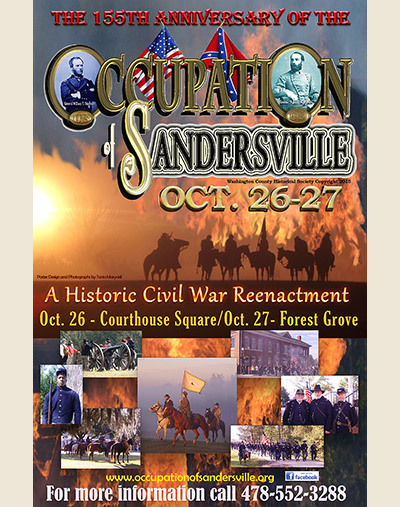 If you would like more information on the Occupation of Sandersville or Sandersville's local attractions and lodging, dining, or shopping opportunities, visit the Local Info page or call the Washington County Chamber of Commerce at 478-552-3288. Please revisit this web page for updates. Pre-Registration Required. Seating is limited.